Join Norman Jay MBE for this special screening of Sidney Poitier classic To Sir, with Love. 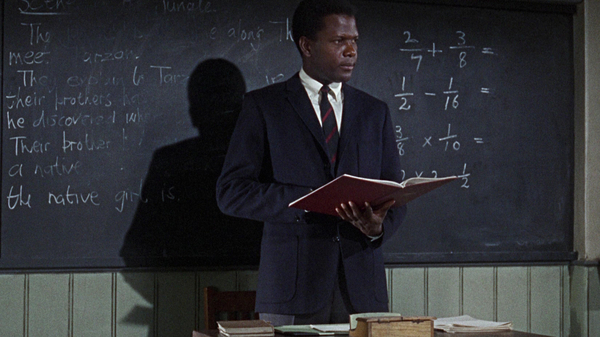 Twelve years after snarling his way through a New york education as a student in The Blackboard Jungle, Sidney Poitier graduated to the chalkface as a teacher in this heartfelt adaptation of ER Braithwaite's memoir. Poitier stars as a Mark Thackeray, a novice teacher at a tough school in London's East End who faces a a class of unruly white working class kids who test him to his limits. But Thackeray, no stranger to hostility, meets the challenge by encouraging the students to rise about their 'you'll-never-do-anything' mentality and by treating them as young adults who will soon enter a work force where they must stand or fall on their own. Lulu (who also performed the soaring theme song which became an international hit) pops up acting tough with the classroom rebels and there's plenty of teased hair, eyeliner, mini-skirts and other 60s gear on show. Poitier's magnetic star power made it the decade's third biggest British film at the US Box Office (behind two James Bond films, no less), and it remains a classic film that accurately reflected some of the problems and fears of teens back then - and indeed now. These events are supported by Film Hub South West & West Midlands, part of the Film Audience Network, awarding funds from the National Lottery. A redneck sheriff (Rod Steiger) and a black Philadelphia homicide detective (Sidney Poitier) reluctantly team up on a small-town murder investigation in Norman Jewison's Oscar®-winning crime drama. A two-month long season celebrating the range, versatility and power of black actors.